Thanks to the storms that ravaged the Midwest last week, Husker fans had to wait an extra week for the debut of the Scott Frost era in Lincoln, but true freshman quarterback Adrian Martinez made that wait worth it with a spectacular performance. Before getting knocked out of the game with a knee injury, Martinez dazzled both on the ground and through the air, finishing with 187 yards on 15-of-20 passing with a touchdown and an interception to go with 117 rushing yards and two touchdowns on 15 carries. Martinez wasted no time making his presence felt. On the first play of the game, he handed the ball off to Greg Bell for a 6-yard run. On second down, he kept it himself and showed off the legs that make him such a good fit for Frost’s offense. Before the snap, Greg Bell motioned out of the backfield. Martinez took the shotgun snap and right tackle Matt Farniok pulled around to the middle as center Cole Conrad and right guard Tanner Farmer blocked the tackle and the end out of the play. Farniok pancaked a Colorado linebacker as Martinez took off up the field. Martinez blew right by inside linebacker Rick Gamboa before safeties Evan Worthington and Nick Fisher converged for the tackle, but not before a gain of 18 yards and a first down. Things went off the rails soon after for the Nebraska offense, leading to a 14-0 lead by the Buffaloes, but Martinez got the Huskers on the board with a 41-yard touchdown run on 2nd-and-5 late in the first quarter. Martinez read the defender rushing off the edge, cornerback Derrick Abrams, then faked the handoff to Bell and kept it himself. The quarterback used a nifty head-and-shoulders fake to juke Abrams out of his shoes and put him in the turf. Martinez planted his left foot and took off with Brenden Jaimes setting the edge from his left tackle spot. Linebacker Davion Taylor tried to chase Martinez down, but he had no chance as the quarterback sprinted towards the pylon. 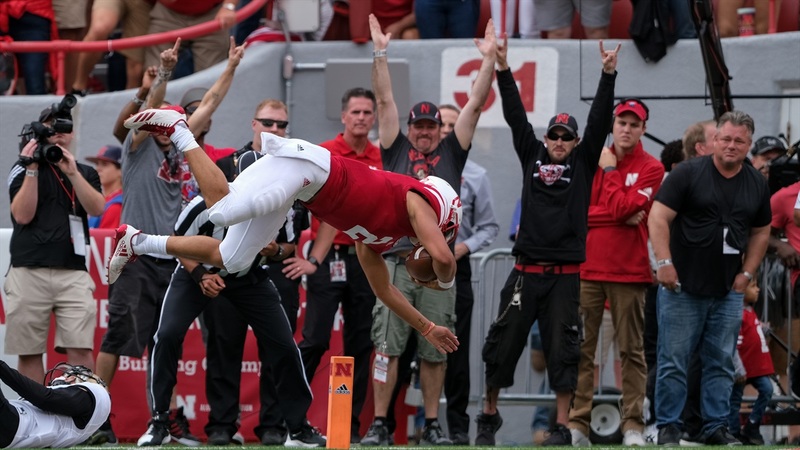 A defensive back made one last desperate attempt to stop the play, diving after him at the 5, but Martinez finished off the run with a somersault into the end zone for Nebraska’s first points of the season. The play was well-designed and Jaimes threw a great block to get it started, but this one was all about Martinez’s quick feet in the backfield and his breakaway speed once he reached the second level. It was the longest run by a Husker since Ozigbo’s 42-yard run in the 2016 Music City Bowl. Martinez’s mobility isn’t just good for long runs. He showed terrific elusiveness in the pocket as well with the highlight coming early in the second quarter. On second-and-10 from the Colorado 27-yard line, Martinez made some magic. Martinez faked the handoff to Devine Ozigbo and the back stepped up to provide some extra blocking, but Farniok got beat badly to the inside and defensive end Israel Antwine ran right between Farniok and Ozigbo. Antwine got his hands on Martinez less than two seconds after the snap, but the quarterback spun out of the sack and ran away from the 6-foot-4, 315-pound end. Martinez got outside the hash marks with a defender closing in from the second level then fired the ball on the move to a wide open Stanley Morgan Jr. inside the 10-yard line. The play went for 19 yards and Ozigbo followed it up with an 8-yard touchdown run to tie the game. As dynamic as Martinez was with his legs, arguably his most impressive play was all arm. On second-and-0 from the Nebraska 43, clinging to a one-point lead midway through the third quarter, Martinez dropped back and let it fly. Spielman had Worthington matched up with him, and although the safety gave the speedy slot receiver a good 8 yards of cushion, it wasn’t enough. Colorado only rushed four and Nebraska’s offensive line held up without a problem, giving Martinez plenty of time to scan the field and the room to step into his throw. He recognized Spielman had his man beat and threw an absolute dime over the top, dropping it right into Spielman’s hands near the 15-yard line. The pass was so pretty that Worthington and Fisher, rolling over from the middle of the field, tripped over each other’s feet and went down in a heap as Spielman jogged into the end zone untouched for the score. The play went for 57 yards and gave the Huskers a 28-20 lead. Martinez made some freshman mistakes as well with two fumbles (one lost), a terrible interception and a second pick saved by his knees hitting the ground, but he quickly showed why he won the quarterback battle in fall camp and captivated many with his dynamism as a true dual-threat quarterback. For now, Husker fans will wait with bated breath to learn the status of Martinez’s knee. If the prognosis is good, Nebraska’s offense has the chance to be every bit as special as Frost hoped for.